Purchase of the Standard in PDF and/or Softbound includes a NFPA 13 PDF with Changes indicated. 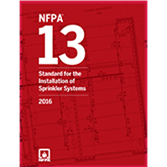 Updates in the 2016 NFPA 13: Standard for the Installation of Sprinkler Systems help designers, engineers, contractors, and installers develop the best fire sprinkler defense for any occupancy. Fire protection challenges have changed along with construction materials and types of storage. Get equipped for today’s hazards by getting up-to-code with the new industry standard for the automatic sprinkler system design, installation, and acceptance testing; hanging and bracing systems; underground piping; and seismic protection. Revisions to commodity classification tables in the 2016 NFPA 13 present the most significant update to the tables in over 30 years. Updated classification tables in Chapter 5 Annex based on today’s materials help sprinkler system designers avoid common errors in classifying commodities. The new tables improve accuracy and reduce the risk for mistakes that could prove catastrophic in a fire. A task group addressed the costly problem of corrosion in piping. In a major change that impacts installers, the 2016 NFPA 13 adds a new requirement that a single air vent be installed for each wet sprinkler system to help reduce potential corrosion activity due to trapped air. A task group concluded that venting the trapped air in a wet system can decrease water delivery time, reduce alarm ring delay, reduce water flow alarm cyclic ringing, and reduce corrosion activity. A new protection scheme for exposed bay plastics in racks has been added to Chapter 17, in response to the potential for serious fires. New language added to Chapter 8 based on studies done by the Fire Protection Research Foundation allows sprinklers to be omitted above certain cloud ceiling configurations. Conversions to metric have switched from an exact conversion into an approximate conversion to make the Standard more usable and cost effective on a global scale. A new provision requires listed window sprinklers to be used where glazing assemblies are used as an alternative to fire-resistance-rated construction. An alternative storage protection scheme has been added for certain storage arrangements, similar to the Scheme A allowance in NFPA 30: Flammable and Combustible Liquids Code. Gain the edge in sprinkler protection to prevent fire deaths and property loss. Interested in previous editions of NFPA 13? Find them here. NFPA 13: Installation of Sprinkler Systems helps reduce risks and fire loss with proven fire protection strategies. Long considered the benchmark for automatic fire sprinkler systems, NFPA 13 presents consensus-based requirements for sprinkler system design approaches, installation, and component options. Compliance is essential to sprinkler performance, which in turn significantly reduces the risks of fire deaths and property loss. Each new edition of NFPA 13 reflects added knowledge about sprinkler performance under fire conditions. Changes are based on scientific research and a wide body of industry experience. The 2010 NFPA 13: Installation of Sprinkler Systems is revised and updated with added criteria based on recent fire testing and studies performed by the Fire Protection Research Foundation. Chapter 20: Special Designs of Storage Protection presents requirements for the protection of three new special storage arrangements, including carton records storage with catwalk access, and high bay records storage. This edition also adopts the SEI/ASCE 7 approach for load calculations and introduces new zone-of-influence tables for Schedule 5 steel pipe, CPVC, and Type M copper tube. An important new method to calculate rack shelf area takes the placement of loads into consideration. The 2007 NFPA 13: Installation of Sprinkler Systems broadens coverage to support innovative technology and Chapter 11: Design Approaches clarifies design options. In a major change, eight new chapters in this edition address storage of specific commodities. Requirements for hanging and bracing meet or exceed the seismic requirements of ASCE 7: Minimum Design Loads for Buildings and Other Structures, and rules for sprinklers in combination with draft stops around vertical openings correlate with the 2006 edition of NFPA 101®: Life Safety Code®. In another important revision, installation rules for residential sprinklers incorporate new research into system effectiveness, specifically with regard to obstructions such as ceiling fans and kitchen cabinets. The 2002 NFPA 13: Installation of Sprinkler Systems improves access to information by consolidating storage design requirements and approaches into Chapter 12: General Requirements for Storage. For convenient referencing, you'll find extracts of sprinkler system requirements from more than 30 NFPA® codes and standards in a new chapter entitled Special Occupancy Requirements. In addition, all applicable provisions for underground piping -- including materials, installation, and acceptance testing -- are presented in Chapter 10, which coordinates with NFPA 24: Standard for the Installation of Private Fire Service Mains and Their Appurtenances. Expanded tables for Early Suppression Fast Response (ESFR) sprinklers allow you to choose the storage and building height for any arrangement. The 1999 NFPA 13: Installation of Sprinkler Systems presents a groundbreaking amount of new information about the proper design and installation of sprinkler systems. Double the size of previous editions, it includes portions of text from storage documents such as NFPA 231: Standard for General Storage and NFPA 231C: Standard for Rack Storage of Materials, along with extracts of or references to sprinkler requirements from documents throughout the NFPA system, including NFPA 99: Standard for Health Care Facilities and NFPA 101: Life Safety Code. Scores of important changes in this landmark edition include specifically identified criteria for special occupancy hazards, new minimum sizes for sprinklers used in storage applications, and a new separation requirement between ESFR and other sprinkler types. Interested in other editions of NFPA 13? Use the drop down menu above to select the edition year you need.